The Brassolini are a neotropical tribe which includes the very large "owl butterflies" (Caligo), as well as a number of other striking species. Many of them are crepuscular, exhibiting rapid flight that almost makes them look like bats. The larvae of brassolines feed on monocots, and some species are pests of palms. Many of the genera are endemic to the Atlantic coastal forests of southeastern Brazil. Phylogenetic relationships among genera are shown based on the phylgoenetic analysis of morphological characters by Penz (2007). Casagrande MM. 1995. Notas sistemáticas sobre Brassolinae. 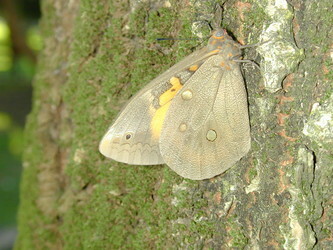 I. Tribos (Lepdoptera, Nymphalidae). Revta. Bras. Zool. 12: 671-699. Penz, C. M. 2007 Evaluating the monophyly and phylogenetic relationships of Brassolini genera (Lepipoptera, Nymphalidae). Syst. Ent. 32, 668-689. Page: Tree of Life Brassolini Boisduval 1836. Authored by Niklas Wahlberg and Andrew V. Z. Brower. The TEXT of this page is licensed under the Creative Commons Attribution License - Version 3.0. Note that images and other media featured on this page are each governed by their own license, and they may or may not be available for reuse. Click on an image or a media link to access the media data window, which provides the relevant licensing information. For the general terms and conditions of ToL material reuse and redistribution, please see the Tree of Life Copyright Policies.